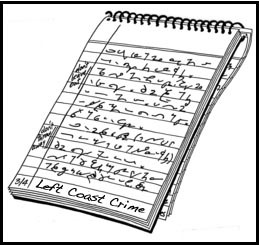 While I’ve long been an advocate and frequent attendee of the California Writers Conference scene, the Left Coast Crime Conference (Monterey, Mar.20-23) is my first foray into the fan-of-the-genre conference. And I’ve already penciled in my commitment to next year’s LCC in Portland, Oregon. The truth is, this is much more fun than writing. Many of the fans are also authors and most of the authors are also fans. There’s a thrilling sort of intensity, a near obsessive adoration at play here. (Some flew in from the Right Coast to hang with their favorite writers. I find that intense.) The fans love new writers who, in turn, love the newly published writers, who in turn love the seasoned writers. And the elite—many of whom were present—clearly love the fans. I watched Sue Grafton get more hugs than a cute baby on Christmas morning. And she didn’t mind in the least. Unlike the workshop-based writers conferences, where both egos and fears can sometimes run rampant, I’ve discovered the fan-based conference to be far more casual, even playful. Fans meet authors, chat with authors, eat with authors and immerse themselves in a genre they clearly love. I put the mystery fan up there with the romance and sci-fi/fantasy fan—dedicated, loyal and extremely knowledgeable. Many of the fans have tried writing, or else find themselves in the midst of their first effort—and what better way than to “feel the buzz.” And unlike the workshop atmosphere (where hopes are often dashed by a careless critique or two), the more casual ambiance of simply chatting about one’s profession, or obsession, strikes me as a far more pleasant way to soak it all up. Far better for those just beginning to write, I think, to be mesmerized by the success of others than to to find oneself in the trenches too early. Yes, writing is hard. Yes, success is hard. But not beyond your dreams. If you’ve wandered through the Left Coast Crime Book Room, you see the astounding possibilities. So where’s the ice water? As a first-time attendee, and first time panelist (“Now What? Industry Experts on New Publishing Options”) I devoted much of my attention to new writers, or those dangling from the precipice. The changing industry has orphaned many successful mid-list authors, who now find themselves struggling with the option of self-publishing or a smaller press. (A midlist author isn’t a best seller, but rather a self-sustaining author with a large enough fan-base to remain moderately successful, from book to book.) However, with the midlist author a vanishing species, what’s the alternative? My co-panelists and I (moderator Stacey Cochran, Christine Munroe of Kobo and Jeffrey Weber of Stark Raving Group) were pretty much in total agreement for the duration. Yes, there’s hope. Options exist for new writers and authors in transition. Traditional publishing is in flux, and some writers will be lost to the Way Things Will Work—but I truly believe good writing will find a home. Small presses (like Muse Harbor) are beginning to thrive—one author at a time. We’re planning just 12 titles for the 2015 calendar year, and not one David Baldacci or J.D. “Nora” Robb among them. Meaning we intend to prevail on the new and midlist author, and are hoping to boot at least one of them upstairs into that stellar category. We have only two publication slots available for our next year’s roster (and I came home with 30+ new manuscripts and queries from the Left Coast Crime crowd—so you do realize the necessity of very good writing) but if the increasing number new presses can churn out a dozen or two authors a year, gradually both writers and readers will find a new influx of talent worth their time and attention. What about self-publishing? Sure, that’s a viable option. However, as panelist/author Claire Johnson said, “You don’t self publish because nobody else wants your work. You self publish because you want the control.” Meaning, good writing is still paramount. Self-publishing affords you the ultimate creative control—marketing, social networking, book design, management, accounting and ultimately pay-off as well—but you have to be ready for that challenge. If you’re self-publishing and still not succeeding, perhaps it’s time for a rewrite? A new novel? A fresh start. The key to success? Many variables—with, for better or worse, a healthy quotient of “luck” among them—factor into a writer’s success. But I believe marketing to be a fundamental key. And few small presses (or large traditional publishers, for that matter) have yet to discover that magical “Can’t Fail” strategy. At Muse Harbor, we’re looking at traditional marketing solutions, but we’re also taking the “small steps” approach, building an author’s audience one loyal reader at a time. No, you won’t be partying with Dennis Lehane or Patricia Cornwell just yet…but with a bit of luck, diligence and perhaps another novel or two under your belt, maybe they’ll be calling you up for an invite of their own. Popular Author Shalanna Collins Debuts “April, Maybe June” Novel as First Book in Bliss Sisters Magical Adventures Series. On March 20, 2014, Muse Harbor Publishing’s author of six published novels, Shalanna Collins, debuts her new Young Adult mystery with a magical twist, April, Maybe June to crime readers and writers during the sold-out Left Coast Crime Conference in Monterey, CA. Collins, a seasoned past conference attendee, will be joined by her publisher, Muse Harbor’s Fiction Editor, Dave Workman, to meet new and veteran crime readers and writers, sign books and promote the launch of April, Maybe June. Workman, crime noir author of On The Rocks, was recently coined by award-winning author Matthew J Pallamary as “The New Elmore Leonard.” Workman will be speaking on a Left Coast Crime Conference panel, promoting both his and Collin’s new crime novels, as well as looking for new authors to publish under Muse Harbor’s moniker. Collin’s clever young adult novel April, Maybe June, finds home-schooled siblings April and June Bliss inadvertently sucked into their older cousin Arlene’s troubled life when the street-savvy 17-year-old disappears, then sends for their help via an inscrutable grimoire and a mesmerizing silver ring. When life turns supernaturally spooky, April and June must pull together to survive. April, Maybe June is available on Amazon.com and Museharbor.com. For more of Collins’ writing, visit her blogs at shalanna.livejournal.com, shalannacollins.blogspot.com, deniseweeks.blogspot.com and Friend her on facebook.com/ShalannaCollinsBooks. Collins graduated from Southern Methodist University with a BS in Computer Science and a BA in Mathematics and has published fiction in several genres, including mystery, fantasy, chick lit, and romantic suspense. She has also published books written as Denise Weeks. “April, Maybe June” is the first book in her Bliss Sisters Magical Adventures series. When she isn’t writing fiction, Collins tutors secondary school math, works as a literacy volunteer, does research on the Internet, and noodles on the piano. She and her husband live happily in a northern suburb of Dallas. To recap: I look for active writing—the life of a novel—on three distinct levels: 1. Voice, 2. Language and, 3. Plot. I’ll keep this simple for both our sakes. If you need a grammar lesson, we’re both in the wrong place. But, in the English language (as compared to, say, Kayabi, and whatever Yoda spoke), the simplest way to invoke energy and emotion into sentence structure is typically: Subject (S) + Verb (V) + Object (O). Thus: John (S) kissed (V) Mary (O). Or: Laura (S) + killed (V) + the snake (O). As opposed to Mary was kissed by John. Or; The snake was killed by Laura. Or even more passive: It was the snake that was killed by Laura. By rearranging the sentence structure to the less energetic Object + Verb + Subject (OVS), the writer’s placing the action’s instigator at the end of the sentence and slightly altering the emphasis. And in longer, more complex sentences, both nuance and structure can become uncomfortably apparent. You’re also clogging your story with extremely passive verbs; “was” and “were;” unnecessary prepositions, pronouns, articles and the so-called “little” phrases (e.g. ; it would, that were, of the, by which). Such utterly unexciting placeholders act as a buffer between words and action. For instance, a subtle but distinct difference exists between: Prince Clarion crushed the giant orc’s head and The head of the giant orc was crushed by Prince Clarion. While both structural formats can and will ultimately co-exist in your novel, play with the most active structure first. This is especially important in scenes of passion, action, high tension or terror. Active: The cow jumped over the moon. Passive: The moon was jumped over by the cow. * Exceptions always exist. You’ll eventually find this particular phraseology a perfect fit for your needs and, by all means, use it. However, if you find yourself using this grammatical gremlin as a basic structural pattern—then no, you’re not infusing sufficient excitement into your writing. You’re using passive language way too often. And no, Muse Harbor will probably not publish you. And, no, simply because Hemingway frequently used passive voice, you may not. And, no, because David Foster Wallace did so in present tense—”I am this” and “I am that”—you may not. “It was…” is glaringly overused in modern fictive writing. More often than not, excessive passive voice is a sign of tired writing. Meaning your brain’s full. Put down your pencil. Take a walk. Take a nap. Clean the house. Because most “it” usage can transmogrify into far more descriptive prose. Occasionally, it fits such sentence structure may suffice your needs, but most often, it does not your words can be easily rearranged with far more passion and creativity. While I doubt any author can (or should) write an entire novel strictly using SVO sentence structure, I suggest keeping this grammatical sequence as a staple tool for active writing. The volcano belched a cascade of hot lava. Rather than: Hot lava was belching from the volcano. Realize that by simply altering your subject (from OVS), you can maintain the SVO principle but also shift your reader’s attention, such as: Hot lava poured from the mountain’s ruptured peak. With nary a “was” or “were” in sight. It was a dark and stormy night. Linda was sleeping. There was a noise that awakened her with a start. What was that? she wondered. Was somebody standing outside her door. Was it her husband, Teddy? It was because she didn’t know that she tiptoed to the door. There was only silence beyond the door. Linda was scared and we, dear reader, are ready to close this book forever. So look closely for any steady stream of passive sentence structure beginning with tired phraseology: It was, They were, There was—and the dreaded It was because…. Each of these sentences can be actively rearranged (and the more you begin to do so, the easier such restructuring becomes). I’ve occasionally come upon an interesting side-effect of passive language. If a writer twists and contorts various, meaningless phrases long and hard enough, the words sometimes almost sound correct. In fact, a writer may even convince himself that such lavish flow of language sounds positively Shakespearean. But this style of writing is roughly akin to spritzing a pig in expensive French perfume. He may smell nice for awhile, but you still won’t want to kiss him. Keep your message simple. What’s the idea you’re trying to impart here? It’s: Richard hated chocolate, right? So how might one say that creatively? How about: Richard couldn’t understand the world’s love affair with chocolate. On his tongue, the candy oozed like motor oil, and tasted, to his best perception, like dirty butter. A simple thought, distinctly perceived, clearly transmitted. Active, not passive.